Living in a caste system means options are limited for America Singer’s future. She’s a Five, an artist, and pretty far down on the food chain. Her secret love, Aspen, is a Six, practically a servant. Marrying him would mean giving up the few comforts she currently possesses. And then they get news about the Selection, an opportunity for 35 girls to enter what turns into a stressful contest for Prince Maxon’s hand in marriage. 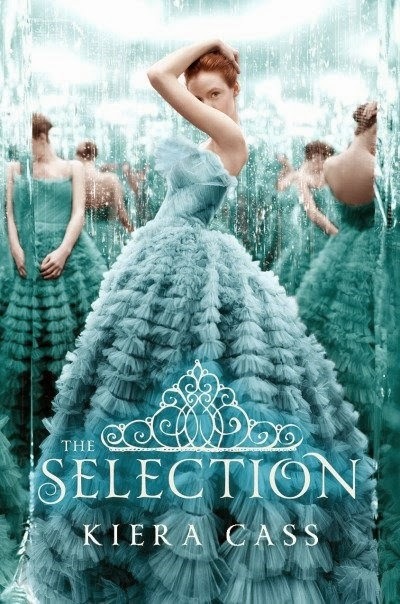 America leaves her family and Aspen behind, but is perfectly honest with Maxon that she isn’t looking for romance. But as the two become close, she begins to wonder if she could in fact fall in the love with kind, passionate, and intelligent prince. This is another book that has been sitting on my to-read list for a long time. I’m not sure what was keeping me from reading it. I really enjoyed it and am eagerly anticipating the sequel. When it comes down to it, this book really is, as my brother described so eloquently, post-apocalyptic The Bachelor. Thirty-five girls show up at the palace to compete for Maxon’s heart, and besides a few chapters concerning conflict with a rebel group, that’s the main storyline. It sort of reminded me of a more pleasant mash up of Wither by Lauren DeStafano, and the make-over parts of Hunger Games with Maxon spending time with each of the other girls and the Selected being very well taken care of. I would agree with other reviewers that say America was pretty annoying. I didn’t hate her, but she whined and complained a lot. And for ‘not caring’ about Maxon, she was very jealous the entire time. Even when she really did think she didn’t care. But their relationship is sweet and develops as a good friendship before romance is brought in (even though everyone knows that’s where it’s heading). I was rooting for Maxon the whole way. Even at the beginning when you didn’t know him. Aspen just never sat well with me. I was worried I wasn’t going to like Maxon. Instead, I was pleasantly surprised. He was very sweet, honorable, funny, and very helpful. As I said above I really liked their relationship and how it started out as a friendship. This was a love triangle I didn’t enjoy. I mean, I didn’t mind Aspen, I just liked Maxon and America together way better than Aspen and America. And I feel fairly certain that Maxon and America are the end game, so I’m not too worried, but I know that it’s going to be a long road filled with triangley goodness. Or grossness, depending on your perspective. There was a sub-plot having to do with rebel forces attacking the palace that added some tension and conflict that was different from the Selection drama. That was nice; I’m interested to see how this progresses in the sequel. I think it could become very important to the main storyline. Recommended for fans of YA Romance; the dystopian elements were there but were not a huge part of the story. The romance was the main driver. This entry was posted in Book Reviews, Romance, YA and tagged Romance, Sci-Fi/Dystopia, YA.